The attempt to model diagnosis according to the epistemological criteria of the pure sciences leads to an objectivization of the patient that undermines the clinical goal of addressing human need (, pp. 183–4). In order to do justice to humanistic concerns, there has been an attempt in bioethics to redescribe or “model” medical reality in such a way as to avoid the transformation of the patient into an object (, ). However, the problem facing any such attempt is formidable: The paradox of the history of medicine is that the humanistic goal of addressing the patient’s needs has been in large part furthered by way of a process in which the patient has been increasingly objectified and depersonalized (, p. 96). 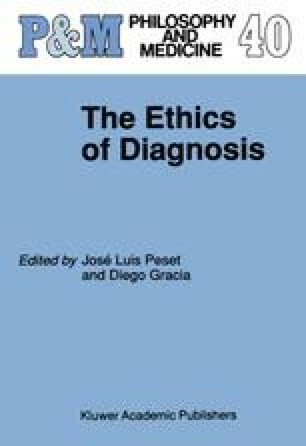 The challenge facing bioethics is thus to model diagnosis in a way that does justice to both the epistemological concerns intimately connected with objectivity as well as the ethical concerns associated with regarding the patient as a subject. Instead of rejecting “objectivity”, we msut find a way to rightly place it within a broader context.